Combine the dried shiitakes and hot water to cover in a small bowl and set aside until softened, about 20 minutes. Drain, discard the tough stems, and thinly slice the caps. Combine the soy sauce, soju, soda, sugar, pear, chopped onion, garlic, black pepper, and 2 tablespoons of the sesame oil in a blender and puree until smooth. 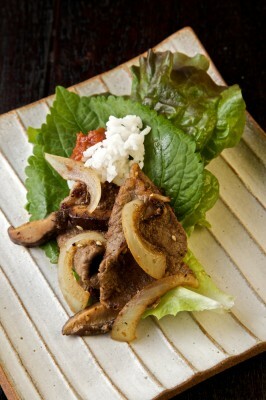 Transfer the puree to a large bowl and stir in the sesame seeds, mushrooms, sliced onion, and steak slices. Cover tightly with plastic wrap and marinate in the fridge for at least 30 minutes or up to 4 hours. When you’re ready to eat, heat the remaining 2 tablespoons sesame oil in your largest skillet over high heat. Working in batches (so as to not crowd the pan and so the meat develops delicious, caramelized edges), add the beef and marinade and cook, stirring now and then, until cooked through, 4 to 5 minutes. Note: Pre-sliced steak is sold in Korean grocery stores as bulgogi. In a non Korean store, ask your butcher to slice it for you. Or if that isn’t an option, put the steak in the freezer for 30 minutes (to make it easier to cut) and then slice it as thinly as possible with your sharpest knife.